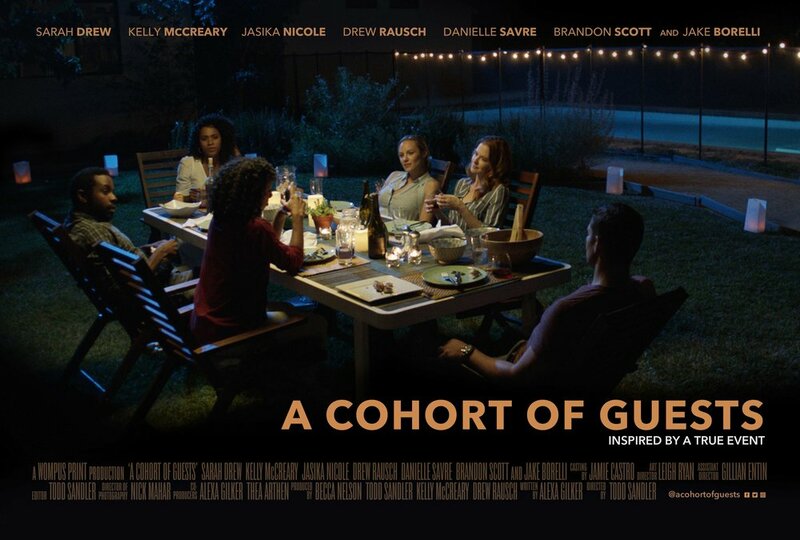 A group of friends enjoy a casual summer dinner party until they are shockingly interrupted by an uninvited guest. ALEXA: After the last American election (I'm Canadian), Todd and I were constantly interrupting our creative brainstorming sessions with these long, heartbreaking conversations as we both struggled to understand a lot of the hate we were seeing projected around us, and struggled to understand how to react to it as artists. TODD: I was waking up every morning and reading what was going on across this country and in all parts of the world, and I had this overwhelming feeling of dread and disappointment. ALEXA: We were asking lots of questions like: will we ever live in a world that is not ruled by a culture of fear and hostility? With such opposing sides increasingly hardened in their beliefs, how will we ever see eye to eye again? And is there any goodness left at all? TODD: These questions fueled our creative mission to disrupt the negativity we are all constantly consuming by sharing stories that deal with themes of compassion, kindness and empathy. TODD: After watching our film, we hope it will be a reminder that we are all capable of compassion and kindness. It helps feed the soul which I would hope we all want to do. ALEXA: Well, first of all, watch it for the amazing actors and rad directing. And then watch it because it will, if we did our jobs correctly, soften you a little bit, in a social climate that is currently hardening many of us. TODD: They are paramount. I can only tell a story if or when I feel I need to tell it. My belief of how characters should engage with others in this world is my jumping off point when developing a story. ALEXA: The universal theme we were working with is shown in the Brene Brown quote we tagged onto our film: “In the absence of love and belonging, there is always suffering”. This is a universal statement that applies very personally to the group of people in this film. TODD: When you are writing, directing and editing the material, you have a pretty clear idea of what the story is going to be. I'd say the nuances and subtleties brought out by the performances helped flesh out the characters in ways that we couldn't have anticipated thanks to the actors. ALEXA: Because Todd and I develop the story together, and then I go away and write the script, there is always an evolution from our conversations, to how the characters emerge on the page, and then to seeing how Todd takes the script and directs it. This film started from some intense emotions surrounding the current political climate, but I think has expanded to be a story beyond a certain political time or leader, to something more timeless. TODD: The feedback has been overwhelmingly positive. We have had some wonderful conversations after sharing it with people. ALEXA: We get lots of “woah” moments with the final scene. That’s pretty rad. TODD: Everyone has their own opinion and feelings of how we should function in the world. I'm always open to listening to opposing views or views that are shared but make me still see something that may not have crossed my mind. ALEXA: To be honest, the feedback really has been overwhelmingly positive. What is surprising to me is that people seem to really understand what we’re trying to say without us beating you over the head with it. That has challenged me to think about how to continue writing films that people on both sides of a political spectrum can see themselves in and be affected by, rather than simply creating for the people who will just pat us on the back. TODD: It's no small task getting your film out there and seen. We welcome any and all exposure to help raise awareness. TODD: At this point, we are hoping to find someone who shares our core belief, which we believe is demonstrated in this film, and who believes in this project enough to help us reach a wider audience. TODD: Essentially, I want to challenge viewers to shift their perspective from one of hopelessness and die-hard partisanship to one of hope, understanding, and openness. ALEXA: What would be really cool is if this film could be used by people on both sides of the political spectrum to encourage their own “people” to welcome those they consider imposters - to their way of life, belief system, economy, whatever- and treat them like guests instead of intruders. TODD: To me, this story is proof that it is possible to “flip the script” on a typical reaction to hostility, even in the midst of fear. Has anyone else been in a situation where they had the opportunity to challenge themselves the way our characters did? ALEXA: Can a die-hard rightie and a die-hard leftie both watch this film and be encouraged to invite each other over for dinner after? TODD: What is unique about our story is that we aren’t speaking from any one particular point of view, and we aren’t ‘preaching to the choir’ the way so many politically driven stories do. In our story, anyone on any political or belief spectrum can see themselves as a dinner guest, but the fact is, we are all the “Intruder”, ie. the ‘other side’, to someone else. I believe this story is unique in its ability to shift perspectives no matter what end of the belief spectrum a viewer starts on. ALEXA: Yeah, ditto. That’s our whole manifesto for this film, really. TODD: We have a bunch of different projects in the works. A few feature scripts, a 6-part limited series and 2 web series that we are shopping around at the moment. ALEXA: Shonda Rhimes, hit us up! We’ve already worked with some of your favs! Building his career as a film editor has allowed TODD SANDLER to hone his craft as a storyteller. He's always been one to use images as a way of self expression and the ability to put two images together to convey an idea, or thought, or feeling is what fuels him. Notable directing credits include the web series, Supreme Tweeter, with Game of Thrones alumns, Harry Lloyd, Maisie Williams and George R.R. Martin which explores identity and celebrity in the age of Twitter; and most recently the off beat satirical comedy, A Proposed Solution. ALEXA GILKER is a screenwriter, playwright and producer currently based out of Calgary, Canada, whose love of film and theatre stems from a really nerdy love of poetry. She has been commissioned to develop and write several feature film, television, and theatre scripts for a variety of production companies worldwide. Notable commissions include The COOL a digital television series produced by legendary music producer, Quincy Jones; ARCHIE 3, a children's feature film starring the voice-acting of Michael J Fox; and Hemingway The Last Word, a one-man play commissioned by Canadian actor Barry Flatman. BECCA NELSON is a film and music agent and represents composers, songwriters, film editors, music editors, and music supervisors. She manages the US Office for Air-Edel Associates. Becca works with professionally established clients and new talent alike to nurture their creative endeavors. By cultivating key relationships with major players in the entertainment industry, she has helped a number of clients reach new levels of success.